You might have noticed that guest posts are few and far between on Bleistift, so it’s even more exciting when there is one. The one today is from my wife who you might have seen on Instagram and Twitter as Paperbound’s PingPing. If you are into Kaweco’s special colours you might have come across the Al Sport in rosé gold which was available in Taiwan, Macao and HongKong. It’s simple, stylish, and yet sophisticated! A couple of days ago I came across the exciting news of more special colours that Kaweco are releasing in Asia end of September. Sebastian Gutberlet has confirmed that for the first year these will only be available for the Chinese market. This means that in the future there’s the possibility that these colours will be released to the rest of the world. 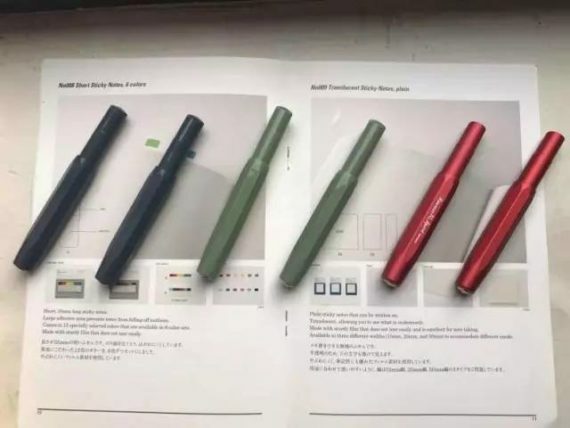 There are three colours for the new release. They are (to my eyes): black blue for the Sport, grey green for the Sport, and red for the Al Sport. As a pocket pen lover, I use Kaweco’s (Al) Sport and Lamy’s Pico and compared the red colour of this latest edition with my lovely Lamy Pico in red. Well, from what I can tell, the Kaweco Al Sport is slightly lighter (pinkish) than the Lamy Pico, while still having the amazing sheen. Personally, I’d go for the red Al Sport ☺️. I believe that the use of wfjsb’s image shown in this blog post falls under “fair dealing” as described by the UK Copyright service. New from Staedtler for 2011/12 and only available while stocks last: limited edition pencils in six colours. They are triangular shaped and their blingness comes from 3D silver stamps on the barrel that are said to look like crystals1. I assume there is some similarity between the “crystals” on this pencil and the raised dots on Faber-Castell’s Grip 2001 – even though the position of the crystals on the barrel of Staedtler’s pencil does not seem improve grip. Thanks to the Office Supply Geek newsletter and to Woodclinched I just discovered that there is a Pac Man Moleskine Limited Edition available. There are altogether four different notebooks and one set with a Pac-Man theme. Another limited edition, to be released between next week and November (depending on where you live) has a Snoopy / Peanuts theme. I have not had any ‘real’ Moleskines before …but since the Pac Man and Snoopy editions remind me of my childhood I might buy my one of these.